We woke up this morning to a dazzling, full-arched rainbow right in front of us. What a sight to behold. The light morning drizzle must have had something to do with that. Today, we head towards Nanga Mill instead of the official Munda Biddi Bidjar Ngoulin campsite. A recent bush fire has devastated the area, including Bidjar Ngoulin. Part of the trail is also inaccessible so there’s a bit of detour as well. After yesterday’s ride, I’m taking the touring route today. It’s easier but not any less scenic. I expect to hit the ex-logging town of Dwellingup by lunchtime and then head towards Nanga Mill using the main road. As usual, Sandy goes on ahead while I take my time with breakfast. The morning has been so gloriously inspiring and I am so loathe to leave this beautiful campsite but … Munda Biddi beckons. It’s not often one gets to appreciate nature when it calls. There’s no one around so I leave the door open to enjoy the view. It’s a different trail leading out of the camp, and more importantly, it’s a down-hiller. …and on to the very nice and smooth Del Park Road. … passing through some farms. As I emerge from the trail at Dwellingup, my stomach steers me towards Dwellingup Community Hotel. I see Sandy at a table out front. He’s treated himself to a well-deserved beer. Seems there’s a pub inside. The quiet exterior belies a noisy crowd inside. Through the glass panes I can see most of them busy dispatching liquid lunches. 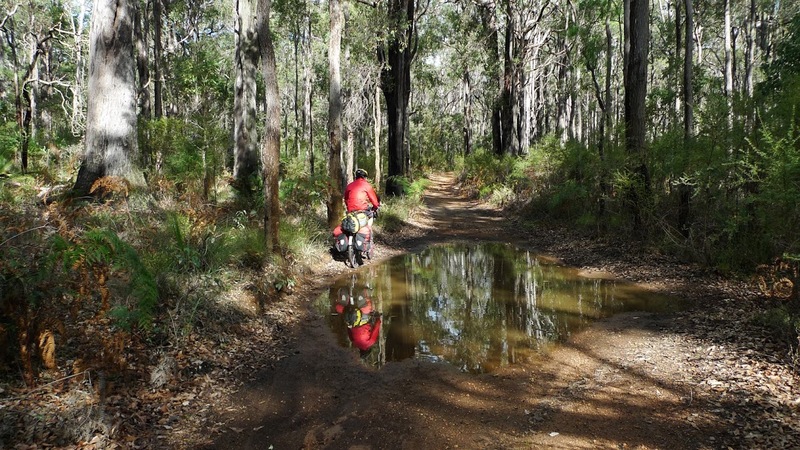 Nanga Brook Campground is a sprawling reserve with a few camping options. The one we’re heading to is Nanga Mill, a free campsite (obviously). After riding around a bit I find the place. Sandy has already arrived by then so we start looking for a perfect spot under the pine trees to pitch the tent. It’s a beautiful campsite but a bit crowded with weekend car and caravan campers. We’re the only cycle-tourers. Yep, that’s the one…free campsite. There’s a toilet facility nearby but no water supply. We contemplate filtering water from the small brook running across the campsite but Sandy, after a chat with our neighbours, charms the mother of 2 big bottles of water for us. I’m still stuffed from the lunch pizza (which I couldn’t finish and had it doggy-bagged) so I had the leftovers for dinner and we both decide to call it an early night. It’s single-digit cold and my 5Cº sleeping bag just barely held up for the night. Maybe that’s why there were no all-night parties going on.